The factsheets are intended for general medical information only and should not be considered medical advice. Specific concerns or questions should be directed to your doctor or other professional healthcare provider. Further information on this can be found in the medical disclaimer on our website. Q: What do platelets look like ? An electron micrograph of a normal platelet (left) and a platelet from a patient with a platelet disorder. A. 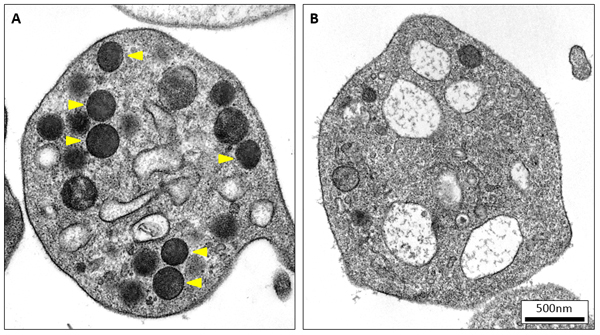 Human platelet with multiple storage compartments (yellow arrowheads). These storage compartments contain proteins that are released at the site of injury once platelets are activated and contribute to the formation of a platelet plug. Q: Are Platelet Related Diseases (PRDs) related to haemophilia? Haemophilia is not a PRD. It is caused by the loss of a clotting factor (factor 8). The inheritance of haemophilia means that women are “carriers” but do not normally have excessive bleeding, and only men are affected. Both haemophilia and PRDs cause excessive bleeding, but the bleeding in haemophilia is typically into joints rather than the symptoms of PRDs described here. Q: Are Platelet Related Diseases related to thrombosis? Thrombosis refers to the formation of life-threatening blood clots which can lead to conditions such as heart attack, stroke and pulmonary embolism. Platelets are involved in many types of thrombosis. However, they are not considered to be platelet related diseases as they are associated with normal or excessive platelet function, rather than a loss of platelet function. Q: What treatments are there for Platelet Related Diseases? There are a small number of treatments for PRDs which should be discussed with your haematologist . These include drugs such as DDAVP (which can be given via nasal spray or under the skin) and tranexamic acid (which can be given as a tablet or into the vein). Both of these medications don’t cure PRDs but help to strengthen and stabilise blood clots. In rare cases blood transfusion can be considered, although this is only used if absolutely necessary. .
Q: How many researchers are working in developing treatments for Platelet Related Diseases? There are many people working on platelets in the UK and throughout the world, but only a minority of these are working on platelet related diseases, in part because of the lack of funding. Testing platelet function is complicated and this also makes research into this area difficult. One of the aims of the charity is to encourage new ideas and new approaches in diagnosing and treating PRDs from laboratories who are currently investigating other aspects of platelet function. This series of Factsheets provide an overview of the known forms of platelet function disorders for patients and family members. Please read the 'Introduction to The Platelet Society Factsheets' first.